There are few things in this world that you can do on a budget. However the DVB Digital dongle is available on amazon.co.uk and on e-bay and most of them are capable of receiving from 24MHz to 1.4GHz . Now that PC 's and laptops have got good processing power,good sound cards and good graphics cards it is now possible to decode those invisible radio waves that are all around us , and to do that there are copious amounts of software out there to decode anything you can hear with a decent Arial, NOT I hasten to add an antenna , with an Arial you can receive on a wide band like from say 28 to 30 MHz now that's a 2 meg band width and is fine for listening, an antenna is tuned to transmit and receive on a very narrow band. 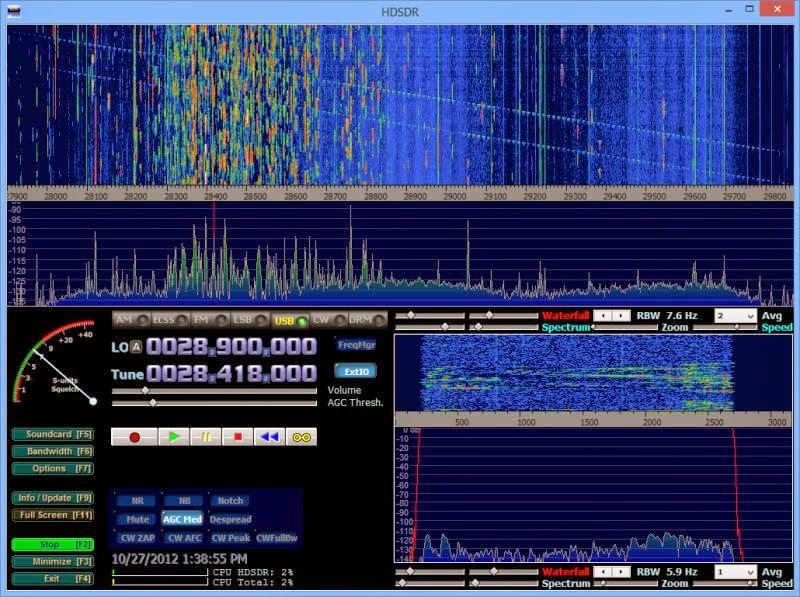 Below is a screenshot of a program called HDSDR and it's quite an intuitive program easy to use and easy to setup and gives you quite a nice display . The fact that it can be used to listen to HF/VHF/UHF/SHF frequencies is just icing on the cake.There are the ever popular RTL1090 that decodes the Mode -S from the aircraft, there is the very popular Plane Plotter, but you only have 21 days to use it and this site here will help you to set it up.There is a program out there called adsbSCOPE and with it comes an alternative to RTL1090 ADSB# .I like that program as its easy to set up and customize to your own liking and below is a screen shot of mine. I don't recommend you take a laptop and dongle to the viewing gallery of any major airport as their security has a funny way of looking at it and could mean the confiscation of your equipment. 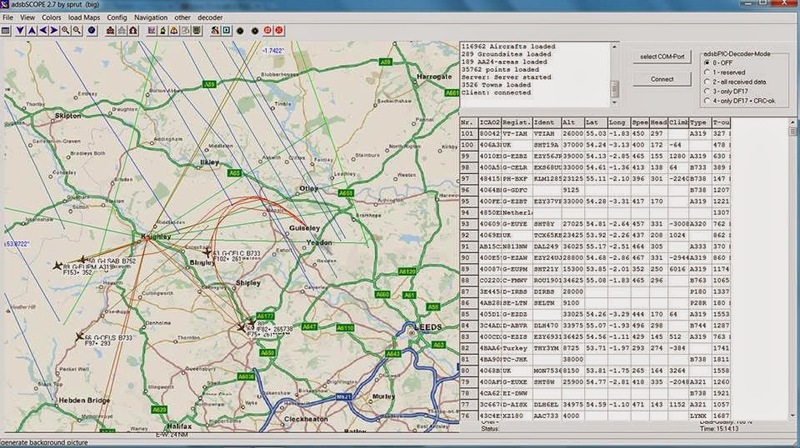 The location of my aerial and the receiver is in the town of Keighley and I am 8 floors up about 118 mtrs above sea level the I made the aerial with these plans here and as you can see I was getting a lot of "hits". Its not expensive and is quite interesting in an amateur radio kind of way ,and you don't need to be an amateur to understand how to set it up and operate it all. well I hope you like this blog, please leave a comment . Great post Phil, I've been playing around with these too, seems like an amazing array of software to make it do all sorts of stuff.